The League and the Lantern is the first in a new series of books written by a concerned father. He was concerned over having quality entertainment for his children. Knowing what is out there, I can understand his decision to write a series himself. Author, Brian Wells is that father. His book, titled The League and the Lantern takes place in Chicago. My family found this sort of interesting, as we visit Chicago 4-5 times a year. In the book, Jake Herndon and two friends, Lucy and TJ attempt to solve a mystery dating back to the Civil War. The book is written to attract children to reading, while at the same time teach lessons regarding character. My daughter read the new book on a recent trip we took. She is 15 and enjoyed the story, although she did bring a couple of things to my attention. We are extremely careful about what is in the books we read and one thing she brought up is a slang term for messed up. She also said that to her it appeared to be a "clean" book with a little Christianity thrown in. Please remember this is our opinion and may vary from your own. 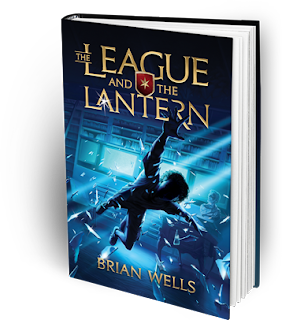 For every copy of The League and The Lantern purchased a book will be donated to be given to a child who can not afford the book. You can find the book at: www.leagueandlantern.com. Take a moment to look at their website and follow their social media pages. Thanks for stopping in and be sure to enter the giveaway. One neighbor will receive a copy of, The League and The Lantern. This book would be for my grandson. book for our family to enjoy.